On Friday 8th December 2017, La La Choirs held their third annual ‘CLIC for Christmas’ concert at Exeter Cathedral. Performing to another sold-out audience, they started thefestive season off with a bang with a selection of Christmas favourites, old and new. La La Choirs were joined on stage by the winning choir from their Devon Schools Choir Competition, Kingsley School from Bideford, as well as the CLIC Sargent singers, a group of young people who have all at some point been CLIC Sargent service users and have taken part in their music programme. 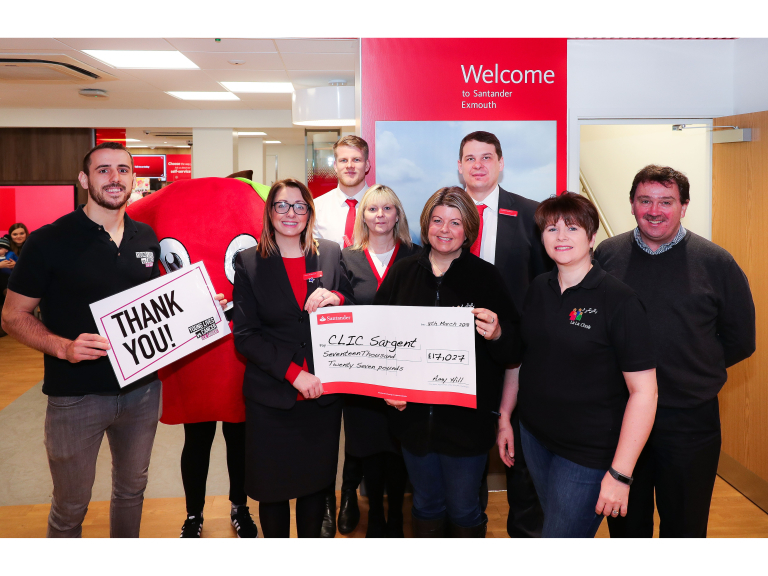 Through ticket sales and generous donations on the night, sponsorship from localbusinesses, plus crucial support and backing from Santander, they managed to raise over£17,000 for CLIC Sargent. Sam Abrahams from La La Choirs said “Each year the CLIC for Christmas concert gets better and better and we are absolutely over the moon with the amount of money we managed to raise. We were very fortunate this year to have secured headline sponsors, Apple Taxis, whose support was invaluable and helped us achieve our target. We are also thrilled to announce that they have agreed to be headline sponsors once again and we look forward to working with them again this year. Once again, my thanks also goes to the staff of the Exmouth branch of Santander who helped run one of the refreshment stands and managed to secure generous match funding. Steve Screech, General Manager for Apple Taxis , remarked “We were delighted to work with La La Choirs last year to raise money for CLIC Sargent - a superb charity which needs all of our support. The concert at Christmas rounded off a great year of being associated with La La Choirs and we enjoyed it so much we are doing exactly the same again this year. We at Apple Taxis promote ourselves at being at the 'core of the local community' and with La La Choirs' help we were able to sing this from the rooftop of Exeter Cathedral! Our relationship with La La has grown and grown and we are looking forward to another year of working with them and CLIC Sargent." A cancer diagnosis means normal life stops for the child or young person, and their family. Treatment is gruelling and often happens many miles from home. Travelling for treatment is exhausting and expensive. CLIC Sargent provides these families with access to our Homes from Home programme, to help reduce the financial, emotional and practical burden of a young person’s cancer diagnosis. Through the provision of free, self-catering, homely accommodation for families, just a short walk from the treatment centres, families are able to spend time together, as well as be in close proximity to the hospital – not having to journey to and from home which, for so many families, can be several hours away. The money that the La La Choir have raised could fund a room in CLIC Sargent Home from Home for nearly 18 months. These homes from home save each family on average £2100.